Date 29.02.2016 We are hosting another Moving Down Under Event, this April 16th 2016. 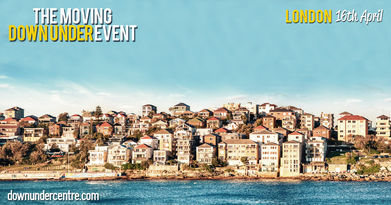 The Moving Down Under Event is a unique Australia focused migration event brought to you by a group of skilled specialist companies who have been migrating internationals to Australia for over 30 years. The dedicated Australian migration event has been created to give those who want to make the move to Australia a reality. The April 16th Australian migration event will be targeted at professionals from the Nursing and Healthcare sector, Construction, Trades, Engineers, Accountants, Recruitment, Digital Marketing and others that fall into the Australian skilled occupation list. This event will offer opportunities for those of you in the early stages of researching the dream move the chance to speak directly with people who can advise you on how to make it happen and employers who can place you in work. We will have Immigration2oz attending, who are MARA approved Registered Migration Agents that specialise in all Australian visa subclasses and will be providing FREE Visa Evaluations, private consultations, together with migration advice on the day. After chatting with them you’ll be able to get some time with one of the recruitment agencies specialising in trades, nursing and other sectors who will be able to connect you with employers in Australia. For people aged under 30 you’ll have a chance to discuss how to make the most of an Australian working holiday visa so that you can not only see as much of the country as possible but secure great jobs and leave yourself open to staying longer, or migrating, once you’re on the ground. Already Booked & Ready To Migrate To Australia? People who have already booked their trips to Australia and have their dates set should also attend as you’ll be able to potentially secure work, set up your bank account and get some great information on the country you’re about to move to. The best part of all this is that every person who attends this exclusive migration event will be given a Moving Down Under Event goodie bag packed with £1000 worth of relocation and travel goodies. Ealing Broadway station is connected to mainline rail services and is on the district and circle lines.